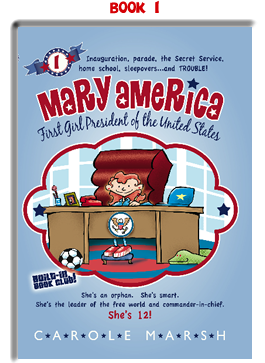 BECAUSE HER FEET would not reach the floor, a small footstool had been placed beneath the presidential desk in the Oval Office for Mary America to rest her feet on. Whenever she sat at her desk (one that had once belonged to President Franklin D. Roosevelt), she always peeked beneath first to see if either “Ssss,” her big, green boa constrictor, or Josh, her pesky younger brother, were hiding there. The reason she had to check was that Josh would often sneak down there while Mary was doing some presidential concentrating and tie her shoe- laces together so that when she tried to stand up, she tripped. And Ssss had learned how to untie her shoelaces, so when she tried to stand up, she also got entangled and tripped. Mary did not like to trip up. She took being President very seriously. It was a hard job. Being smart made it easier. Being a kid made it harder. People often thought they could “trip Mary up” because she was just twelve years old, but they soon learned better. Nonetheless, it did not help a President to fall flat on her face when greeting the Secretary of State or the Queen of England. So Mary always checked her shoes—twice. This morning, Josh was at school. He was lucky that he got to go to public school, Mary thought. Her other grandfather (referred to as the First Gramps by the media), who lived with them in the White House, had insisted that Josh not be escorted by the Secret Service to school. Josh was disappointed, but it was not like Gramps to be foiled in any plan. (He and Mary had that in common.) Their grandfather had insisted that the school bus pick Josh up each morning and bring him back each afternoon. So everyday, the big yellow bus had to stop for Bomb Check. The school bus driver, short, little, bald Mr. Crumbly had to show his ID. And ALL the kids squealed greetings to Josh, who waited patiently beneath the north portico to get picked up. Mary was always a little wistful as she watched the cheery school bus motor off. Mr. Crumbly always gave her a “high five” out his window as he pulled away and the joyful cheers faded as the bus left the White House gates. Due to “security issues,” Mary was home schooled. At least she was home schooled in the White House. She preferred to say she was “house schooled,” but Gramps said that made it sound like she had a building for a teacher. In a way, she sort of did. The White House was certainly a constant education, she thought, as she doodled on her President of the United States of America notepad. 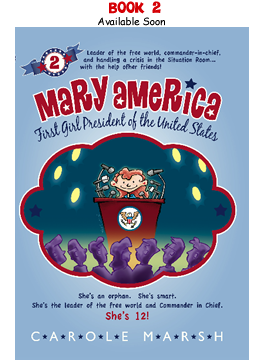 But this morning, Mary’s job was to educate Congress, which did not seem to be able to balance its budget. “Got it all figured out?” asked Mrs. Denim, her former fourth grade teacher, who now served as the Secretary to the President. That had been Gramps’ idea, too. He thought it would add some stability to his granddaughter’s day to have a friendly, familiar face nearby, and it was. But even better, Mrs. Denim was really, really “teacher good” at dismissing people who just thought they could barge or charm their way in to see the President whenever they wished. Also, Mrs. Denim made great hot chocolate, which she placed on a Presidential Seal coaster at Mary’s right hand each morning promptly at 9:30. “Thank you, Mrs. Denim,” Mary said. She sipped a quick, careful gulp, and as always, wound up with a whipped cream moustache. “Red as blood!” Mary complained. 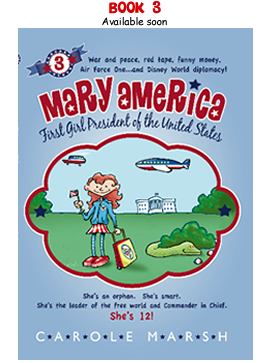 “And I have to go before Congress tomorrow and I am sure they want me to approve their big, bad budget, but I just can’t do it.” Mary stomped her right foot on her footstool for emphasis and felt a big squash. She looked. Yep, Ssss had taken up residence there, napping as usual. She gave her sweet, silly pet a foot rub. If he slept, maybe he wouldn’t slither up the side of her desk and sneak cocoa like he often did. Usually the whipped cream ended up on the top of his head like a pioneer lady’s bonnet. “Soooooooo?” inquired Mrs. Denim, removing the empty cocoa mug and wiping up peanut butter cookie crumbs. “Call in the Kitchen Cabinet?” Mrs. Denim asked. “Their calculators?” Mrs. Denim guessed. Mrs. Denim looked utterly puzzled. “TOP SECRET?” I assume.